On Thursday June 4th, 2015 at the Courtyard by Marriott Bridgetown in Barbados, 40 business executives representing 20 companies from diverse sectors across the Caribbean, met to discuss the issue of NCDs (noncommunicable diseases) at the ‘Caribbean NCD Private Sector Forum: Measuring and Engaging the Business Sector Response to NCDs.’ The primary objective of the Forum was to provide an opportunity for senior business executives to discuss mechanisms for implementing and strengthening private sector-led workplace wellness programmes and outward facing community initiatives; and exploring strategies to more effectively interact with government and civil society. Among those in attendance were the senior executives from the Massy Group, The Guardian Group, Banks Holdings Ltd, FCIB/CIBC, PWC and Liat. CEO of the UICC Dr. Cary Adams, himself a former top executive in the Banking Sector provided opening remarks highlighting why businesses have a critical role to play in meeting the 25*25 global NCD targets. The Hon. Minister of Health Mr. John Boyce, Dr. Magna Aidoo (Commonwealth Secretariat), Dr. James Hospedales (CARPHA) and Sir Trevor Hassell also provided opening remarks. The key outcomes of the meeting were: Sharing and exchange of knowledge and experience about role of the private sector in the multi-sectoral response to NCDs; Presentation of findings of a survey of wellness programmes in private sector and of the role that the sector has played thus far in the wider community in NCD prevention and control; Presentation of a Caribbean Private Sector Response to Non Communicable Diseases (NCDs): A Framework For Action (FFA); Sharing and discussion around the Statement of Support of the private sector’s response to the prevention and treatment of NCDs. The meeting was sponsored by the Commonwealth Secretariat. 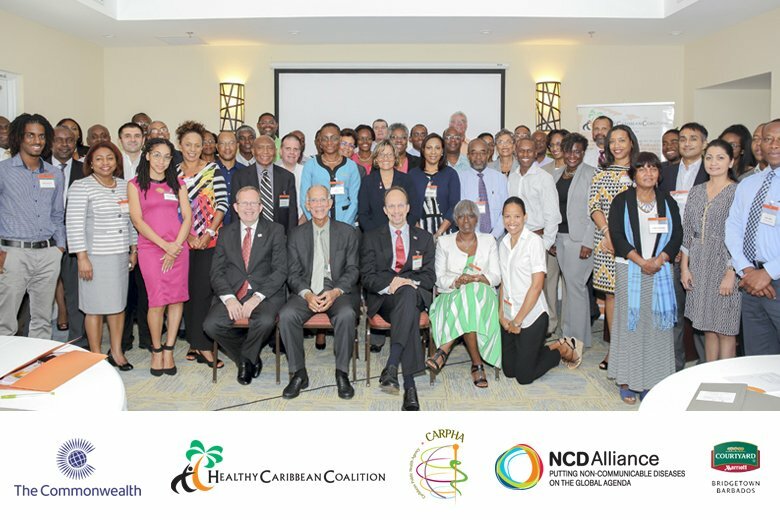 Official workshop partners include The Caribbean Public Health Agency (CARPHA) and the NCD Alliance. 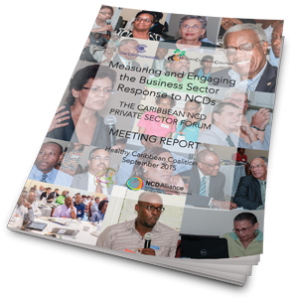 The Caribbean Private Business Sector: Statement of Support on Prevention and Control of NCDs view/download. 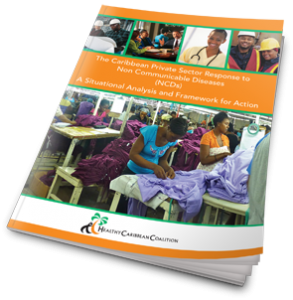 The report is a Situational Analysis and Framework for Action and represents, to our knowledge, the first documentation of the knowledge, attitudes and practices of the Caribbean private sector’s involvement in the prevention and control of NCDs. It details the experiences of Caribbean business with worksite wellness programmes and the attitudes of businesses towards provision of working environments that prevent NCDs and care for those already affected by them. It also examines engagement of companies on a corporate level with community, national, regional and international NCD prevention and control programmes and it assesses the readiness of the business and industrial sector for future involvement. Finally the report incorporates a framework for action that was discussed at the private sector consultation and refined thereafter. This framework presents a way forward for the business and industrial sector to engage with government and civil society in the public health arena with respect to NCDs. This is a meeting report of the The Caribbean Private Sector Forum held on 4th June, 2015. The meeting of regional business executives, representing a wide cross section of industries, was aimed at creating a platform for sharing of experiences and dialogue around greater engagement of the region’s corporate sector in the multisectoral response to the prevention and control of NCDs. The primary objectives of the Forum were to provide an opportunity for senior business executives to discuss mechanisms for implementing and strengthening private sector-led workplace wellness programmes and outward facing community initiatives; and to explore strategies to strengthen the capacity for public private partnerships (PPPs) through more effective interaction with government and civil society.